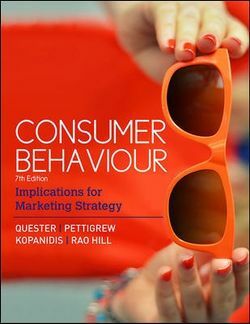 This is the seventh edition of the successful Australian adaptation of Consumer Behaviour by Quester et al (formerly Neal et al). Pascale Quester has taken the lead for this edition, along with Simone Pettigrew, and together these two greatly respected authors established a highly credible author team. They have produced a well-organised book that starts with the decision-making process before clearly articulating the various influences upon it. This edition covers contemporary topics such as social and mobile consumer behaviour, environmentally friendly products, ethics and the impact of the Internet on consumer protection and privacy. Each chapter is enhanced by a suite of fresh new vignettes, case studies and advertisements, both global and local. Currency and accuracy are once again a key strength of this text with all new case studies, adverts, data and research. The cases also reflect the increasingly global nature of consumer behaviour with contributions from academics across Australia, New Zealand, Asia and the Middle East. This rich print and digital package guides students' exploration into the field of consumer behaviour through a student-friendly layout and design.